Historically it could be said that I have been known to jump into a new interest elbows first. Obviously feet first is the conventional method, but I figure people expect that, so I lead with my elbow and on occasion my clavicle. Yes I have jumped into woodworking clavicle first. I had no idea that when I splashed in neck deep into this new hobby that I would find the joy of blogging too. I really only intended to write that first post. External validation is a powerful aphrodisiac. Everyone has been so friendly, which isn’t surprising to me, as I am a firm believer that most people are pretty decent. What I didn’t expect is that there were so many other people sharing their experiences with the world. There are lots and lots of blogs. Today is my one month anniversary as a blogopotamus. I thought that I might share, with those who have been so kind to endure my daily streams of ridiculousness, some of my numbers. Frankly they are so shocking to me, that I find it hard to believe. 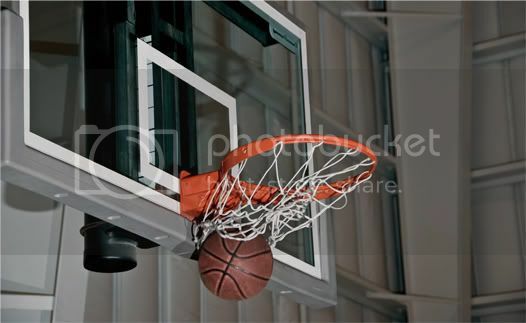 I feel like I have hoisted up the basketball of blogging and swished it from center court. I have scribbled out thirty one consecutive posts and considering that my original goal was to have a streak of one, I count this as a success. I am a big fan of setting the bar low. I was great at the high jump, while the bar was still lying on the ground, of course I later carved a small trough in the field for the pole, just to be sure, but I digress. In one month, the combined number of reads between Lumberjocks and my blog has been around 21,000, with 10085 of the reads being the fine folks who hang out at Lumberjocks, and at least one of their wives, who, on occasion, will pretend to be her husband and once posed as her husband’s cat. I am not sure if the cat is a reader or not, but I would like to think he checks the blog out when nobody is looking. So yes, there has been easily 2000 pounds of external validation. Strange as it may seem that has not been the best part. The best part has been using all the little tips and tricks I have gotten from comments, articles and other blogs. My confidence level is so much higher than it was when the year began. My circular saw and router are less scary. I still respect them and always call them Sir, lest they become angry and try to get me. But it seems we have an understanding, if I treat them well, clean them off after every use, and give them a cookie, they will perform marvelously. 1) ‘The Village Carpenter’ and is written by Kari Hultman. She is such a good writer, photographer, and a spectacular woodworker. She left a comment on one of my blogs and I was giddy for hours. 2) This is a fantastic blog, which I am sure you have all found, but just in case, it is called ‘The Wood Whisperer’ and is much better than the blog the ‘The Tree Shouter at the top of His Lungs.’ Ok, I made up that second blog. But the point is that his blog is a one stop shop for wood smarts. 3) ‘The Unplugged Woodshop’ wins the award for best site design. The writing is fantastic too, the projects fill one with inspiration, and the photography is magazine quality. I have also made some friends on Twitter, who like woodworking. My Twitter handle is ExtremelyAvg and I have had the pleasure of meeting 85 people who are mostly fans of woodworking. If you haven’t tried using Twitter for woodworking knowledge you have missed out. The tweets are chuck full of links to stuff that I wouldn’t have found. Some of my Twitter friends, who I would recommend following are: ScottAtMirus, AdamKingStudio, eXapath, iwoodknot, Torch02 Most have blogs too and are worth checking out. So in conclusion, I want to express my sincere appreciation to everyone who has commented and encouraged me, and to those who have taken the time to blog from their knowledge base, and share it with the world. Tomorrow I will continue with the adventures of Henry Wood. And after that I will write ever day, unless an emergency golf outing is declared, in that case, Dad and I will be on the tee. I am really ready for spring, the novelty of snow and cold has worn off. Thanks again. Man, you had me worried there for a minute … the first part was reading like a blog obituary. Oh noooo…that wasn’t the intent. I just needed to take an night off from Henry Wood, as I didn’t want to get predictable. BTW, thanks for mentioning The Village Carpenter. I had overlooked that blog, and it looks pretty good. My dogs also read your blog – and they keep asking why you give so much mention to cats. However, they were thrilled that one time (at least) you mentioned that dogs are wonderful. Validation is very good. Recognizing it when it happens is even better! I have really done a terrible injustice to dogs, and I will do my best to make it up to them. I have a flying dog photo they might enjoy. LOL. OK, I was fibbing. Only one of them can actually read. But he passes it on to her. It is all about team work. To both you dogs, “Woof Woof, Bark, Howl and Woof”, though they have probably already heard that one before. Hopefully your back swing was done.. 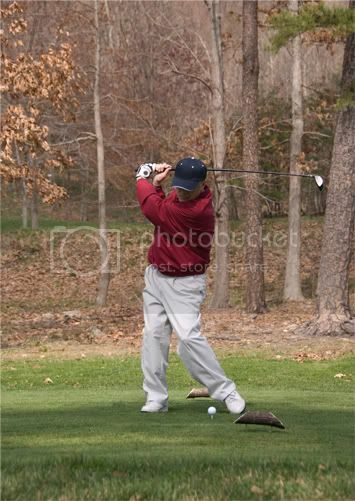 If not I think your going to pull it to the left..
That is my Dad’s back swing. And no, he hit it right down the middle. Had it been my backswing, you would have been 100% correct. Meow! – oh no. hurry up and post this thing – I see our human coming this way. Put your damn paw on the mouse and post it! Our cats outnumber our dogs 4 to1 and they don’t expect to take second place ( note we have 6 dogs). 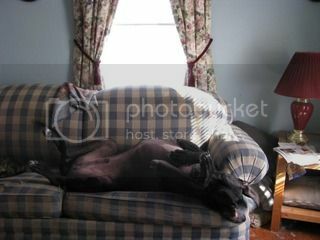 hehe, that is a wonderful picture…OK Everybody…this post is now the Show us YOUR Pet blog!! !